Technology has lately been transforming the face of healthcare with each milestone invention. Telemedicine, a term which is often used interchangeably with telehealth and connected health, has been one of the most revolutionizing aspects in healthcare of late, though the idea of contacting a healthcare professional over the telephone appeared in medical literature as far back as the time when Alexander Graham Bell first invented the telephone. The surge of smart technology, however, has added an unforeseen dimension to the idea of telemedicine that has been made advanced with the ubiquitous access to video chatting that has been made smoother by high-speed internet, affordable smartphones and standardized phone operating systems. Secure cloud storage, interoperable electronic health records and wearable health trackers have further encouraged users to take advantage of the offerings of telemedicine. 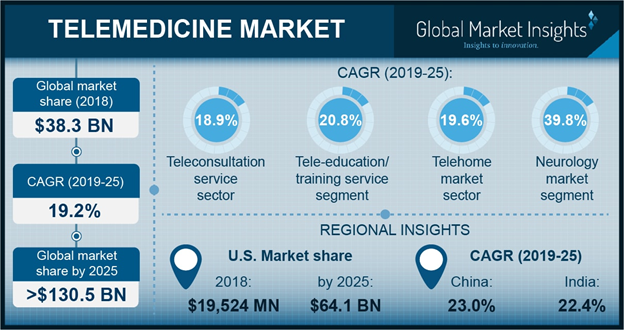 With the pervasive presence of smartphones, the growth of the telemedicine market has found massive impetus with the industry valuation projected to surpass $130 billion by 2025. Besides the advent of technology other factors like an expanding elderly population, need to extend expert medical services to remote locations, need for more psychiatrists are among the leading drivers responsible for the rising popularity of telemedicine. The aging population has emerged as one of the chief beneficiaries of the rise of telemedicine. The healthcare system that is perpetually running short on doctors and nurses can improve care coordination and management with an increased focus on telemedicine. A report by WHO predicts that the population of people aged 60 years or older will increase to 2 billion by 2050. Amid this scenario, there seems to be no better time than the present for the telehealth sector to establish a firm footing that can make it capable of serving the present as well as a future generation of the elderly. It is especially beneficial for the geriatric populace to take advantage of telemedicine as many of them suffer from chronic disorders and have to visit a medical practitioner more often than most. But for them, the waiting time at a hospital or healthcare facility can prove to be grueling and many are so far incapacitated that they are not physically capable of visiting a doctor. Telemedicine or telehealth has also changed the way people are aging. Not only are older people living longer but are also growing more conscious about their own health and living more active lives at a more advanced age leading to change in traditional approach towards healthcare management. The innovative new approaches include telehealth platforms and mobile health devices designed specifically for senior patients as well as programs designed to improve outcomes at long-term care and senior living facilities. Telemedicine has also become instrumental in keeping various remotely located and rural hospitals viable, helping them to stay fiscally sound and enabling local providers to consult with specialists and care for patients instead of patients having to travel far away for adequate treatment. 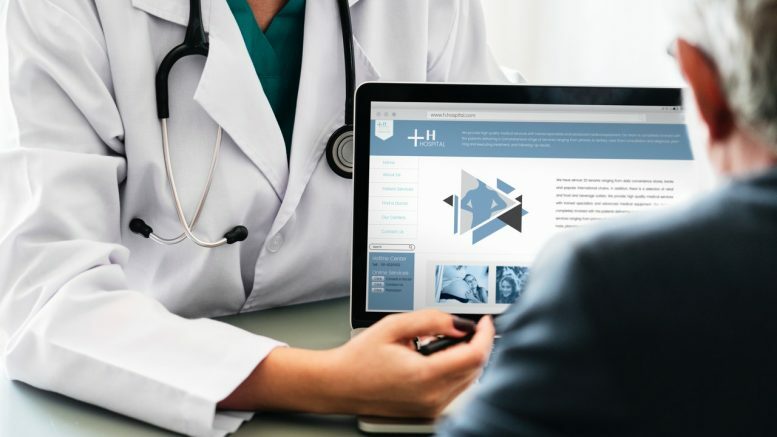 A strong internet connection to support a clear video connection and detailed maintenance of health record and other information are the basis for the success of telemedicine. The practicality of telemedicine has been duly noted by the American Hospital Association which has recently urged the federal government to boost telemedicine opportunities such as improved access to broadband, financial support for new technology and better reimbursement especially for the struggling rural hospitals of the nation. According to the report compiled by the American Hospital Association, a drastic increase has been noted in telehealth visit rates among Medicare beneficiaries. In 2004 there were about 7000 telehealth visits, while in 2013 the number has increased to 108,000. Noting such improvements, Centers for Medicare & Medicaid Services has been working towards enhancing coverage and reimbursement. The organization also called the federal government’s attention towards the need to increase investment in broadband connectivity, the most critical component in the development of telemedicine services. It was found that often rural states have postponed the adoption of telehealth supporting legislation simply because the adequate broadband infrastructure was not available to make telemedicine a possibility. With the strengthening of broadband connectivity, the option for home-based rehabilitation is also expanding as for patients who had been discharged from ER or the ICU, or patients who have suffered from neurological disease such as multiple sclerosis, Parkinson’s or dementia, the care process is often continual. In most cases, it is difficult for such patients to travel to a health care facility regardless of whether they are in an urban or rural setting. Telemedicine can help in conducting a cognitive or psychiatric assessment, remotely monitoring a patient’s pedometer readings, lead group therapy sessions and provide patients with online resources. Telemedicine can also prove to be a major cost-saving option for the healthcare system as having been underlined by a North Carolina based five-hospital health system, FirstHealth. As published by mHealthIntelligence, FirstHealth used a grant from the Duke Endowment to develop a management program for selected patients who did not qualify for Medicare-funded home health services. In the pilot program, patients were given an mHealth enabled tablet that helped them to keep track of their vital signs and send that data to FirstHealth. According to FirstHealth, rehospitalizations would have cost the health system more than $8,000 per patient while the telehealth platform cost roughly $700 per patient. Thus FirstHealth was able to save nearly$2 million by using telehealth, further proof of the cost-saving advantages of not only telemedicine but also of its ability to support home-based care. As if to underline the importance and attention telemedicine deserves, the Arizona Senate recently passed a bill unanimously intending to expand telemedicine coverage, especially as the state is being gripped by a shortage of primary care physicians. The bill would be boosting payer coverage for connected care guidelines service and remote patient monitoring. Arizona is apparently joining the ranks of various states in the U.S. that are striving to expand telemedicine instead of limiting the platform to specific specialties or communities. They are essentially helping healthcare providers to expand their home-based care management and direct-to-consumer telehealth services. As the world veers towards the adoption of 5G broadband, it is predictable that telemedicine will soon become a mainstream means of healthcare service rather than an optional one. A content developer by profession, Saipriya Iyer has dabbled with the domain of content creation for nearly half a decade. She now boasts of an enviable portfolio, holding substantial experience in penning down pieces related to technology, finance, and a wide spectrum of other industry verticals. A qualified computer engineering graduate from the University of Pune, Saipriya can often be found leveraging her knowledge of software technology and electronics in her write-ups. Be the first to comment on "Telemedicine Stands to Offer New Horizons to Healthcare Solution Landscape"